The American Alliance of Museums affinity programs offer exclusive discounts on product and services to AAM members. Our affinity partners offer everything from credit card processing to discounts in fine art and D&O insurance, hotel stays and office supplies. Take advantage of these exclusive programs today! Huntington T. Block Insurance Agency Inc. 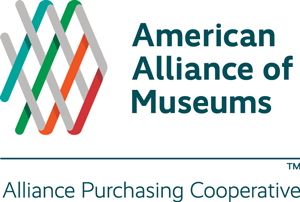 The American Alliance of Museums and Huntington T. Block Insurance Agency, Inc. have partnered to provide its members with customized insurance programs for the Museum’s Collections and Temporary Loans, Property & Casualty Program and Directors & Officers Liability. Each unique program will provide the broadest coverage possible, at the most affordable premium available and supported by a knowledgeable and responsive team of risk professionals. Read more about what Huntington T. Block is offering AAM members. Get something back for your everyday purchases with the Bank of America AAM Platinum Plus® MasterCard® credit card and WorldPoints® rewards. Bank of America, 1-866-438-6262, Priority Code: FAC2XO. Exclusive discounts for members on auto and homeowners insurance. Visit www.geico.com/disc/aam or call 800-368-2734 and mention AAM for a free quote. A benefit for Tier 2 and Tier 3 museum members, the cooperative vendors provide discounts and programs exclusively for our members. Products range from office and janitorial supplies to LED lighting to printing to exhibition and collection materials. Learn more about the Cooperative and start your own savings plan by visiting the website. Take advantage of exclusive member discounts through STI, a specialized transportation company with more than 40 years of museum and fine art transportation. STI, 1-800-234-2788; Request a quote today! You also receive exclusive member-only pricing on all AAM products and programs! Bookstore Publications: Order publications online today! AAM Members are entitled to a 20 percent discount off all AAM titles in the Rowman & Littlefield catalog. Please use coupon code AAMPRESS20 when ordering. Call toll free at 800-462-6420 ext. 3024 to order by phone. Order online here. jobHQ: Searching for a job, thinking about grad school, building your network or looking to get ahead? You’ve come to the right place! AAM has the tools and resources you need to manage your museum career. Search or Post a job online today!